In the Old Masters .Academy ™ we follow the Old Masters painting technique traditions, namely the Flemish Methods, in its purest state as well as in a state partly modified by painters such as Giorgione, Titian and Rubens. An Underdrawing for Oil Painting was an essential part of the Flemish Method and now we are going to review materials we need for this. What is the best medium for Underdrawing? Let’s look at what we have as ideal materials and those which are not entirely appropriate for the task, but are quite often used. Charcoal, Sanguine and Sepia; these are the classical choices of the Old Masters with Charcoal being an obvious favorite. These are all Charcoal and Sanguine sticks with various characteristics. Now we need to choose the right type for an Underdrawing. We need a so called “chalk” type, which easily crumbles into powder and can be swept off the surface leaving just light traces. Such material can be effortlessly erased with light movements of an eraser. Take a stick and rub it gently – if it smears onto your fingers and effortlessly turns into powder when pressed – it is exactly what we need. 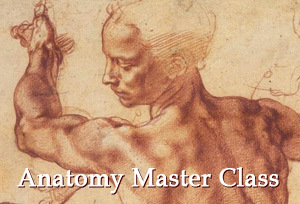 If you feel that the stick is waxy and your fingers are not colored easily – avoid such materials in Underdrawing. You might be surprised why. 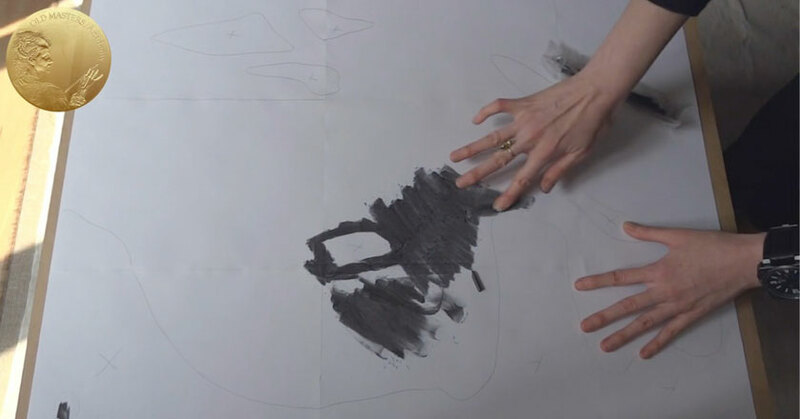 An outline made in waxy materials, especially when much of the canvas surface is covered with preliminary drawing – can form a foreign filling between the ground and following paint layers. Look at this illustration – The oil from paints do not penetrate through waxy materials into the ground as it should, thus the areas with Underdrawing hold onto the surface very poorly. Soft materials, like dry Charcoal, Sanguine and Sepia, allow oil from paints to go through and be partially absorbed by the ground. 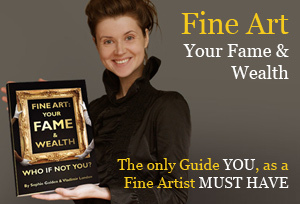 They allow your painting to perfectly adhere to the ground and form one inseparable piece. 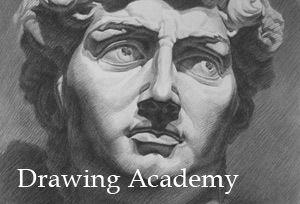 Natural sticks of willow or vine charcoal also perfectly suite the Underdrawing needs. They can be easily erased and also allow oils to go through charcoal particles and slightly penetrate into the ground. 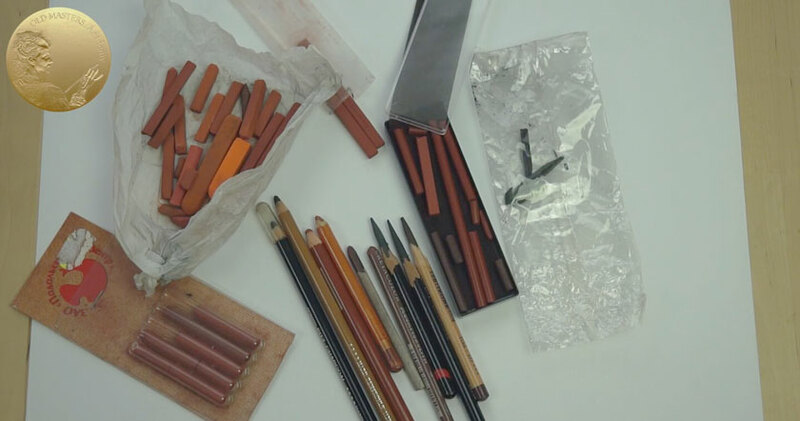 Let’s have a look at frequently used materials that are not recommended for Underdrawing: Waxy sticks of Charcoal, Sanguine and Sepia, as we just discussed, as well as Oiled Charcoal, Sanguine and Sepia –which produce very rich fat lines that are beautiful by themselves, but are not suitable for Underpainting. We shouldn’t take the risk and make the Underpainting too heavy. With time, lines drawn with such materials may become visible beneath discolored layers of paint, especially if paint layers are thin. Conté sticks – are composed of compressed powdered graphite or charcoal mixed with wax; this means it’s better to stay away from them when Underdrawing. And of course Graphite, which I would say is the most popular of all. If you make slightly visible subtle lines in graphite, that’s OK, but, you should avoid using too much graphite. Sometimes artists start to build the composition straight on the ground, applying a lot of lines, erasing them, applying again, shading, making tonal drawing. In such way, the ground may become covered with graphite which obstructs oil paint from absorbing into the ground. And once more, what kind of materials are better to use during Underdrawing? – soft sticks are ideal for the task. We also need an effective eraser for eliminating excess drawing lines, or if you find that the lines are too bold, we can partially erase them – a soft Kneaded Eraser would be a great choice for such tasks.